You’ve probably heard the quote content is king a million times by now. There’s a reason why brands and marketers are devoting more money than ever into content marketing. But which type of content should you focus on? And it’s not so strange, really! The human brain resonates a lot better with visual content than it does with text. Would you rather read a 2000 word blog post than watch a 10-minute video that teaches you about the same subject? And studies prove that you’ll also be able to learn more by watching the video. And yes, I know, it’s a bit counter-intuitive that I am rambling on about this in a several thousand word blog post which you are going to read, but hey, while video content has proven to be more effective, people still love text (obviously, you do), so that’s what I’ll be serving for you. Humans resonate a lot better with visual content. So are you creating it? The ones that shy away from creating visual content are the people who don’t really know how to do it and are unsure where to start. This is why I am serving you with this complete guide to creating appealing visual content, so you’ll know what you should do, and how you do it. Visual content has proven to be more powerful in all aspects of marketing. Safe to say, if you haven’t made visual content a core part of your marketing strategy, you’re missing out big time. And to feed your brain’s need for visual content, I’ve also included visually appealing content in the form of an infographic, which will also allow you bring more information with you when you leave, which is ultimately my goal here. So what it is that makes visual content so impactful? When you can understand the psychology of humans and how their brains work, that’s when you can generate amazing results in marketing. What’s more, visual content is processed 60,000 faster than text in our brain. This means that the information that is shared visually will have a bigger impact on us humans than text. And when you think about what that means for marketing, you understand just how powerful visual content is in marketing. We have the statistics that back it up. In fact, content with relevant images gets 94% more views than content without. Furthermore, more than 80% of respondents in an interview said that visual content is important or very important in their marketing optimization on social media. Now, with all of this in mind, you might be thinking ”oh, well, if visual content is so powerful, I can just throw visual content everywhere”. And hopefully, you also realize the immense potential that lies in visual content. But as with everything, you cannot just produce something sloppy and expect it to drive any results. As more and more marketers understand the power of content marketing, more and more of them will begin creating it. 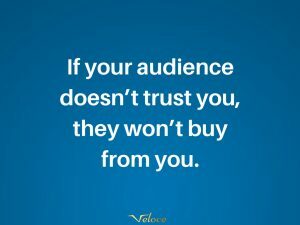 This puts a great demand on you as a content producer to never compromise on the quality of your content. Because if you do, people can go somewhere else to consume better visual content. Something you have to remember is that while images play a part, they must be relevant to what it is you are sharing and the point you’re trying to make. If it doesn’t support your message, conflicting messages can be sent. An image is worth a thousand words, and this means that an irrelevant image can ruin the entire message the words are portraying. Images do not work unless they back up, and give a visual portrayal of the message you’re making. If you’re using Instagram, this analogy gets very clear, because the better your visual is, and the more relevant is, the higher engagement it gets. Too many brands focus on the impression and reach metrics. If they’ve reached X amount of people, they’re happy. But is that really your goal? Your goal is to impact your audience and ultimately get them to convert. That’s exactly what visual content helps you do – if you’re creating appealing visual content. Visual content will help you grab the attention of your audience, but truly appealing visual content will allow you to impact them. Because while 93 percent of marketers take part in some form of content marketing, only 42 percent of them consider themselves effective at it. In other words, they might be getting the reach, but they might not be making the impact that they’re hoping for with their visual content. By producing appealing visual content, you can not only grab your audience’s attention, but you can make it stand out from the crowd, make it memorable, and ultimately make it something that helps you mediate your ideas better. Now, with these statistics in mind, you’re probably eager to start creating incredible visual content that dominates the game, but shortly after, you’re wondering what type of visual content you should be creating. The types that come to mind are photos and videos, but the truth is that there’s a lot more than that that you can set your teeth into. 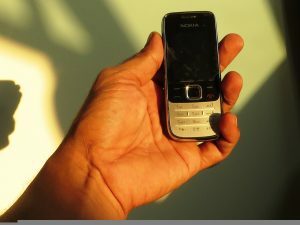 Moreover, that’s the content that everyone is creating, which makes it harder for you to cut through the immense noise. Images might be the most popular type of visual content. The best part about it is that it is universal, and can, therefore, be repurposed for your blog, as well as your social media. In fact, if you’re using social media APIs, the visual content you want can be attached to the post if you just click the share button – something that will allow your social media post to have a greater impact. Studies have found that when you split up your blog post with images, people will be more likely to continue reading, as the visuals help break up your text and make it more digestible. Did you notice that it is exactly what I’ve done in this post? In fact, it is what I do in every single post that I publish. Jeff Bullas cites that articles with images get 94% more views than those without. As the attention span has decreased heavily over the years, as a result of the insane amount of information that is accessible at our fingertips. This makes it more important than ever two create content that is visually appealing, and that grasps your audience’s attention and gets them to stay. Ideally, you should be using images that you yourself have taken (or someone in your team). You can use stock photos, but you need to be very selective in doing so. (More on that later). The good news is that today, you don’t need to invest thousands of dollars into camera gear in order to be able to produce quality photos. Hold the camera still and avoid making the photo blurry. Ideally, you should use a tripod. Remember that when I am talking about photos, I talk about actual photos that you shoot with a camera. There’s a difference between images and photos, and I’ll go more into images further on. Videos are a tremendous type of visual content that has dramatically increased in popularity over the years – especially as a result of the birth of various video sharing platforms such as YouTube and Vimeo, giving brands a place where they can showcase their work. If you succeed in creating a unique video that brings people value – whether it be educational, a good laugh, knowledge, or anything else, sharing your videos on sites like YouTube can grant your brand a ton of exposure. In fact, there are a number of brands who have built their whole success on the back of platforms like YouTube. A brand that has done this is Dollar Shave Club. They created a video that was authentic and played on their audience’s emotions, a video that today has over 25 million views. One year later, the brand was sold to Unilever for one billion dollars. This just goes to show the immense power that video has. There are a million different ways you can leverage video marketing in your content marketing strategy, and this is solely dependent on what your goal is with your videos. 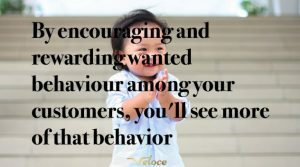 A popular way is to highlight the issued that your audience is often having, and then present the solution that your product offers. An image says more than a thousand words, so what about a video filmed in 60 frames per second? With videos, you can better convey the message you’re trying to make, and impact your audience even greater than you can with photos or images. In fact, a study found that including a video on a landing page increased conversions by 86%. And this just proves the thing I am getting at. Blender brand Blendtec created a video series where they blended a ton of different objects, such as iPhones, which demonstrated the immense power and durability of their blenders. This entertained their audience and gained the brand a ton of exposure, which at the same time allowed them to demonstrate the quality of their blenders. After all, I am writing about it today, which shows just how effective their video marketing has been. Screenshots are particularly popular if you’re writing blog posts and want to demonstrate something as a part of a how-to or tutorial. I regularly use screenshots, in my posts as they make it easier to understand what I really mean. When using screenshots, you need to ensure that you’re not taking any screenshots that are scaled badly or screenshots that don’t really bring any value to the reader. For most computers, a simple command allows you to take a screenshot (for mac it is Cmd+shift+3/4), but there are also a few tools out there that help you do it. If you’ve taken a screenshot, you also want to crop away unnecessary elements which can distract. To draw the attention to the thing you’re trying to show, you can also add arrows so people’s focus goes to where it should go. GIFs are fun and engaging, and therefore helps prevent your audience from leaving. They are actually quite simple to use, and with the help of tools like LICEcap, you can create visually appealing GIFs in a heartbeat. You can create them without having any animation skills from before. Remember to not make your GIF too long, as it can result in lost attention. Sometimes, you don’t need the most advanced designed images to get your point across. With just little drawing skills, you can draw on a paper and then take a photo of that paper. Some might argue that drawing a quick sketch makes it look unprofessional, but others can argue that it will show that you’ve really put effort into creating your piece of content. So much visual content is designed on computers these days, and by drawing on an actual paper, you can actually stand out from the crowd, and create a piece of visual content art is unique, has flair and personality. The good news is that you don’t have to be the most professional drawer. It can be enough to just draw an image or illustration that you’ve seen on the internet. This is two types of visual content that is highly popular – both on social media, on websites, and inside blog posts. Sure, these are technically just a piece of visual content with text on top, but the fact that they are made into a piece of visual content makes the message you’re trying to make so much more appealing and easily digestible, allowing you to better convey your point. If you’re creating this type of visual content, it is great to create them in a similar format that makes them cohesive. This makes them easily recognizable, and your content strategy looks a lot more coherent. You can either have an image that is related to your quote in one way or another, or, you can just add a single colored/designed background. Which you choose is completely up to you. As you can see, all of our quotes have the Veloce logo at the bottom which allows them to remain coherent. Plus, if someone uses them, the source is clearly visible. There are several tools you can use to create these visuals, and I’ll go more into detail of some of the most popular ones you can use further on. When you’re doing this, just make sure the text is readable, which means a large font, and not a background color which blends in with the text. The best part about quotes is that they’re super shareable on social media, which helps you with exposure of the effort you’ve invested into creating it. Just reading statistics is no fun. It’s a lot more fun to read it if it’s visually appealing and turned into a piece of visual content, right? By leveraging the power of visual content, you can convert complex data into easily digestible visual content which allows people to instantly understand the point you’re trying to make. Ahh, the good old infographic. You didn’t think that I would talk about visual content without including infographics, did you? Infographics are amazing for allowing you to present complex data and information in a way that is appealing and that keeps people glued. Few people want to read a long text about a complex topic, but if it’s presented in an infographic, sign me up! Not only are infographics super shareable, a lot of people in your space would also be more than happy to share it, as it brings people value, but it does so in a fun and engaging way. Creating a visually appealing infographic is a little more tricky than taking a great photo or designing an image. For an infographic to be appealing, it needs to use the right colors, and the disposition has to be done in a coherent matter that encourages the reader to continue reading. It also needs to leverage whitespace and shapes so that it draws the attention to where it should be. Of course, you don’t have to be an expert to create a great infographic and the many tools that are available offer an array of templates that you can use. When creating an infographic, something you must pay great attention to is that you don’t include too much text. If you have too much in your infographic, there’s a risk that it will be overwhelming and ultimately prevent people from continuing to read. After all, the idea of an infographic is that it is going to present your text in a way that makes it easy to consume while empowering your message with visuals. Memes significantly gained traction a few years ago, but now, they have slightly decreased in popularity. And the truth is that memes are nothing new. In fact, the term ‘meme’ was first coined by Richard Dawkins in 1976, which described ”the capacity to replicate itself into different meanings from person to person”. Today, that term is used a little differently. Now, they’re known as images which have humorous captions on top – almost like quotes, which I spoke about earlier. Memes can be a real success for your content marketing strategy, but they don’t suit all brands. As memes generally are a bit unserious, some brands will come off as unprofessional if they use them. However, if you’re a brand with a personality that is known to be fun and engaging, memes might just be for you. This is especially true if you’re targeting a younger audience, as they are the ones that resonate best with them. Canva is the single most popular tool for marketers to create stunning visual content. It offers tons of templates for all kinds of different visual formats, as well as editing tools, elements, and free images. 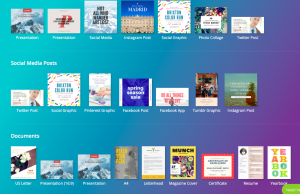 Canva is super easy to use, and the best part is that it is free (it offers the ability to buy different images and elements). Canva truly turns everyone into a design expert. It has a ton of formats for infographics, which is great considering infographics can be a little tricky to create. To get started with your infographic, you can go to Canva’s infographic page. No matter what form of visual content you’re going to create, Canva has it. Venngage is a tool that allows you to create infographics as well as a bunch of other types of visual content with the help of their templates, icons, and much more. What’s unique about this tool is that it offers the addition of social analytics, allowing you to track the people who are looking at your visual content. BeFunky is a free tool that allows you to make fast image adjustments such as cropping and scaling. The tool also allows you to edit, upload, and save, without having to log in. This is probably not a new tool for you considering it is so widely used. It is a go-to too for many beginner designers. Snappa is a tool that you can use to create different graphics, as well as for al social media channels. Tiff is a tool that helps you identify the best font for your design, as it can be quite a tricky job, based on the fact that there are literally thousands out there which you can choose from. The tool allows you to identify the difference and contrast between two fonts by layering them one on the other. When can you use stock photos? Everyone doesn’t have access to a pro camera and a studio, and therefore, a lot of people turn to stock photos. But if you’re going to use stock photos, you need to be careful, and be selective in the images you use. As per the infographic, you should avoid overused stock photos. These are photos people have seen a million times before, and because they’re now being fed it a million and one times, they might even roll their eyes and leave you. Maybe even for your competitors. When using visual content, it is important that your visuals are relevant, but most importantly, it is important that they bring value. 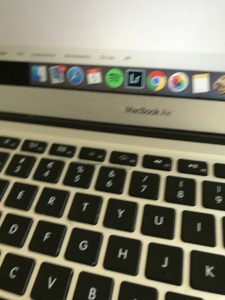 When I first started writing on this blog, I was a beginner. My writing was terrible, and I had no idea how I could write amazing blog posts. So I did some research, and quickly, I realized that I needed to have images that would break up my text and make it more easily digestible. I took a bunch of stock photos which brought no real value to the text and added them to my post. Now, I have to point out that there’s absolutely nothing wrong with using stock photos, but whatever you do, make sure they bring your audience value – or at the very least is relevant to the content you’re sharing and the point you’re trying to make. Colors are a huge part of creating visual content. You can, of course, create stunning visuals that are black and white, but colors have shown to have a huge impact on us humans, and this is something you can leverage in your marketing to get people to feel some kind of way that can benefit the objective of your visual content. There’s a reason why Coca-Cola’s logo is red, and why McDonald’s is red and yellow. Hint: it’s not a coincidence. For instance, if I want to mediate a sense of trust to my customers when I am trying to get them to convert, through a video, I can have the psychology of colors in mind when creating it, and use colors that give a sense of trust. Let’s refresh our memory of what kinds of feelings the different colors mediate. As we can see, the color blue mediates a sense of trust. And if you’re trying to leverage visual content to get your audience to convert, you can have that in mind. This is why it is important to have the psychology of colors in mind when creating your visual content, but more importantly, know the objective with your visual content, and then choose colors that support your goal. 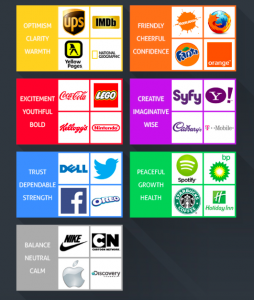 Now, I could go on for hours about leveraging the psychology of colors in marketing. In fact, I’ve already done so in this article, and if you want to learn how, you are more than welcome to read it. It’s clear that visual content is dominating social media. In fact, 63% of the content shared on social media consists of visual content. Moreover, 66% of content being shared on social media is visual content. And that number isn’t decreasing any time soon. In fact, it is increasing, and among the content,you’re seeing in your feed, more than ever is visual content. Today, there are more social media users than ever, which also means that a ton of content is being produced. What this also means that the competition of gaining traction with your visual content is tougher than ever. This also means that unless you’re creating unique and visually appealing content, you’ll get lost in the noise. I’ve already revealed some things you have to think about when creating your visual content, but something that we keep coming back to is relevance and value. These are two things you want to ensure that your visual content has and brings your audience and two rules of thumb that are easy to remember. Visual content is dominating content marketing, and it’s not that strange considering humans resonate a lot better with visual content than text. Today, the majority of content being shared on social media is visual, and more and more content that is being shared is visual. Content marketers have also realized the importance of visual content, and many have made it play a central role in their marketing, whether it be through videos, infographics, or photos. 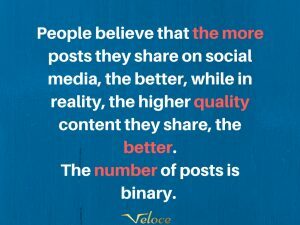 But since the marketing landscape is so immensely competitive, it’s simply not enough to share any type of visual content and then wait for the results to roll in. In order to generate great results with your visual content, you need to create stunning visual content that crushes the competition. Because that’s how you win.